In the west coast of India located along the Arabian Sea is India's smallest state by area, Goa. 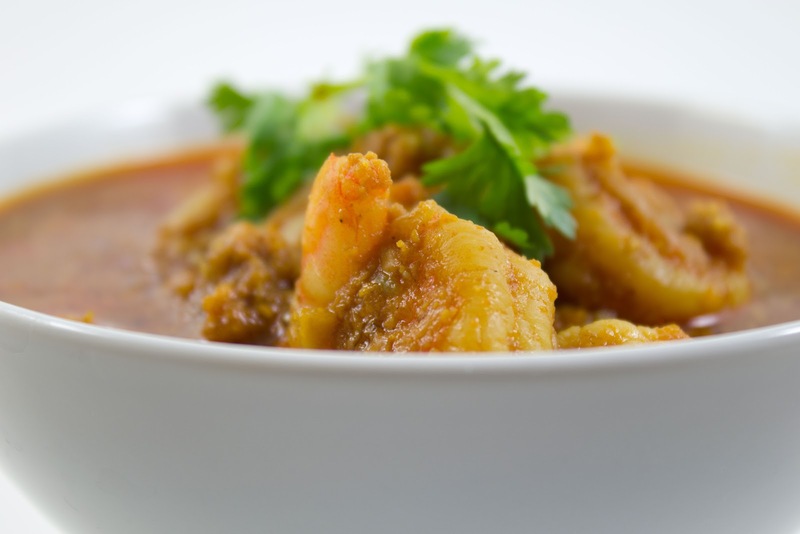 With picturesque surroundings and tropical climate Goan cuisine has intense spices and flavors and has been influenced greatly by both Hindu and Portuguese culture. Goan food is considered incomplete without seafood, and along with coconut milk, rice and tamarind paste forms the main ingredients in Goan delicacies. 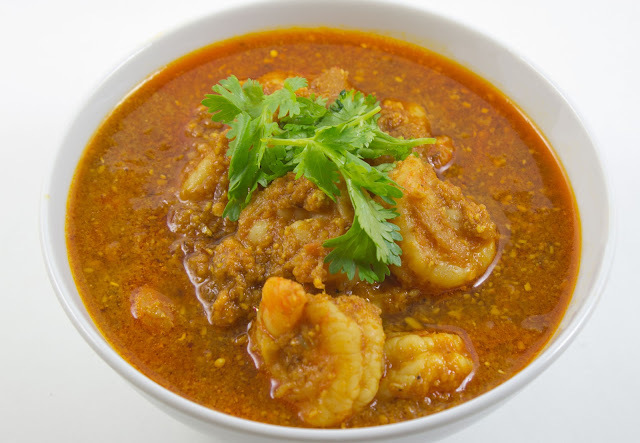 Goan Shrimp Curry is a popular dish served with rice. 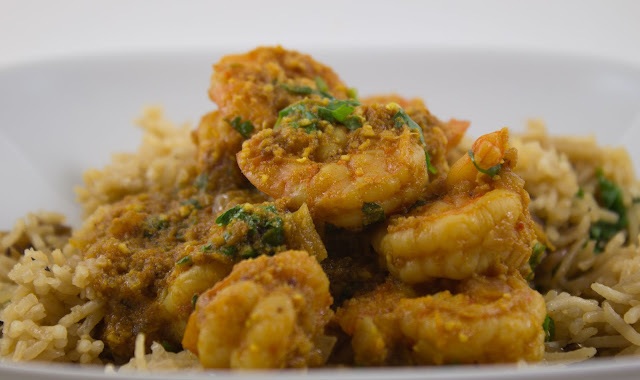 This curry has layers of flavor -- tartness of tamarind, hint of sweetness from onions and creaminess from coconut, spice from a variety of chilies. Spice level is high. So reduce or omit them according to your desired spice level. 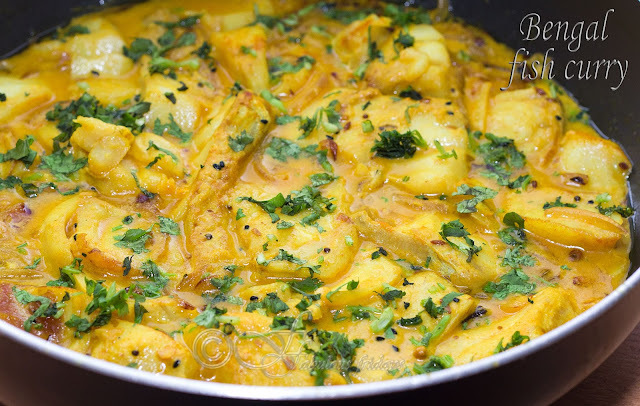 Same recipe can be tried with fish, just increase the cooking time in the last step to 7-10 minutes. Soak cumin seeds and red chili in a tablespoon of tamarind pulp and water. Add them in a blender along with coconut, tomato, mustard seeds. Grind to a fine paste. Keep aside. In a pan heat oil and add dry whole spices and roast for 30 seconds. Add chopped onion and ginger garlic paste and fry till golden brown. 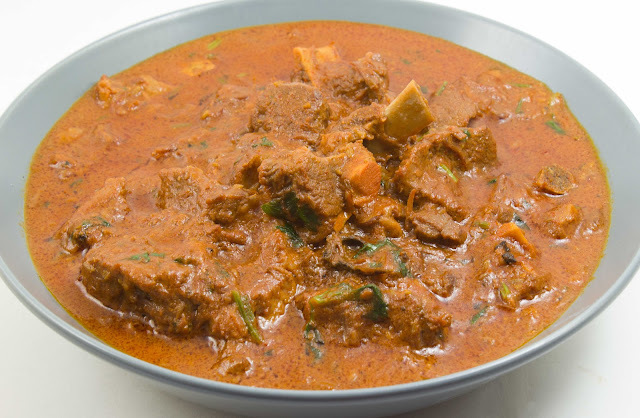 Add turmeric powder, coconut mixture, coriander powder, sugar and black pepper and cook at simmer till oil separates. Add some water to reach the desired consistency and bring to boil. Now add shrimp along with green chili and cook for about 5-7 minutes on high till the shrimp cooks through. Finish off with fresh chopped coriander. Rinse the rice several times in cold water. Drain. Soak in 4 cups of water for 30 minutes. In a saucepan heat oil and add cumin seeds, bay leaves and sugar. Roast for 30 seconds and add sliced onions. Cook while stirring till onions turn medium brown. Now add the rice along with the water, salt, ginger and green chillies. Stir well and bring to a boil. Simmer covered for 12-15 minutes till all water is absorbed and rice fully cooked. Remove from heat and let stand undisturbed and covered for 5 minutes. 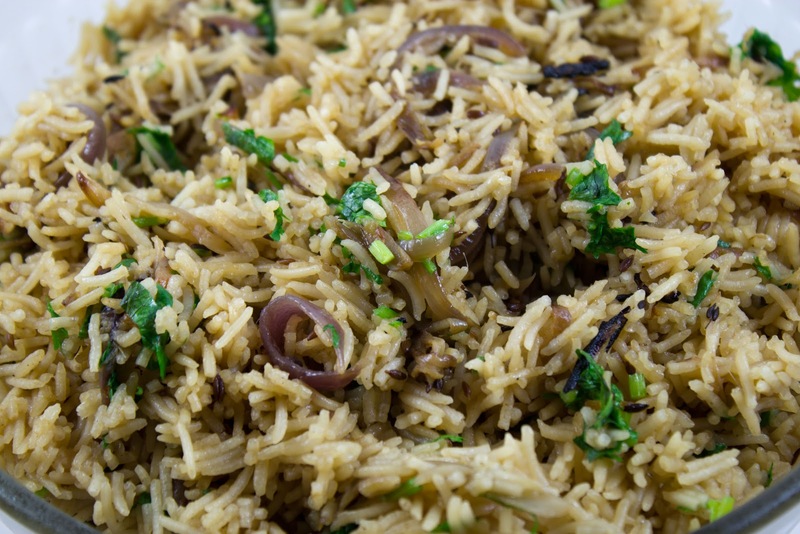 Remove bay leaves and add coriander and fluff the rice with fork. Chicken Curry, also referred to as Chicken Korma or Chicken Masala is a popular curry from Northern India. The korma sauce is a mild creamy curry sauce with a rich silky flavor. 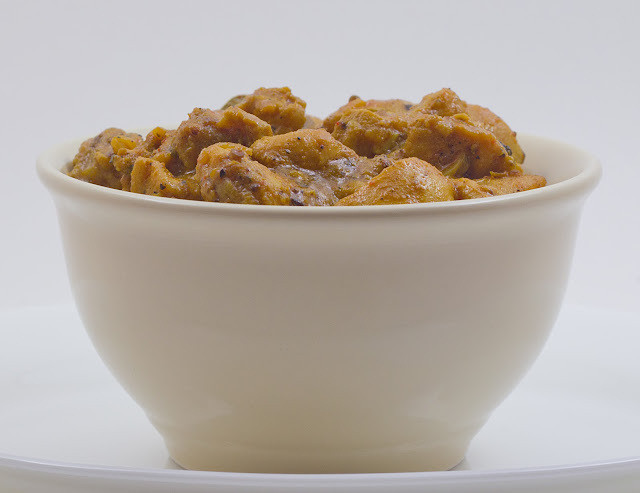 The main ingredients that give this dish a distinctive taste is a blend of yogurt, cream and pureed nuts along with toasted spices.Chicken is slowly cooked in the sauce to infuse the flavor and give it a rich texture. 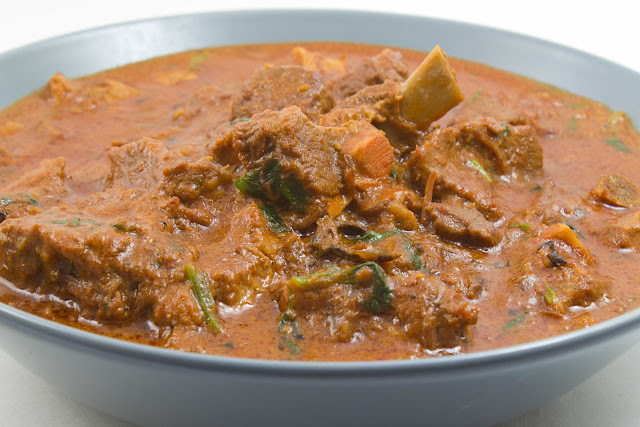 Both chicken and lamb can be cooked in this sauce and for vegetarian option use paneer (Indian cottage cheese) or an assortment of vegetables such as cauliflower, peas, potato. This dish can be served with naan or rice. 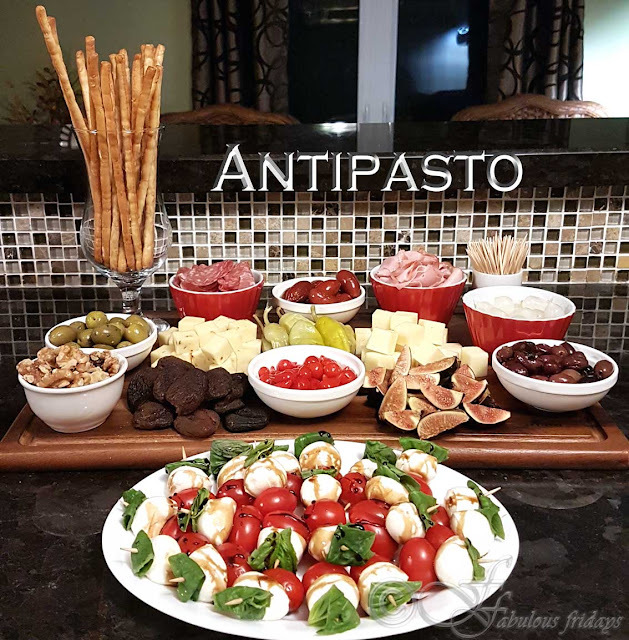 These starchy accompaniments absorb the sauce and complement the meal. Other sides can be a mixed salad and papad. 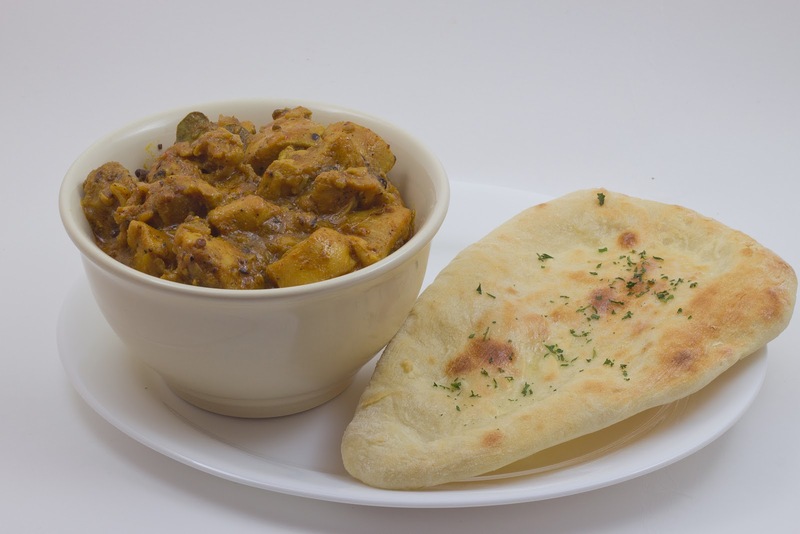 Naan is an oven baked flat-bread very popular in the South East Asian cuisine. A typical naan recipe consists of white flour mixed with salt and sugar along with yeast and yogurt to make a soft elastic dough which is kept aside for a little while to allow it to rise. Once risen the dough is divided into balls, flattened and cooked in a Tandoor or Clay oven. Many variations of naan have found their way in the Indian Cuisine, each as popular as the other. Marinate the chicken in the marinade for 1-4 hours. In a small pan dry roast all the whole spices on high heat for 2 minutes till they impart a roasted aroma. Dry grind them in a coffee grinder coarsely and keep aside. In a large pan heat oil and add the coarsely ground whole spices along with bay leaf and stir for 30 seconds. Add onions and garlic and cook till the onion turns light brown. Add tomato and ginger and cook till tomato softens, for about 2 minutes. Now add the chicken along with the marinade and mix it well with the onion concoction. Let cook on medium high with the lid on and turn it around every minute so it doesn't overcook at the bottom. Do this for about 5 minutes. Reduce the heat to simmer and cook with the lid on for about 12-15 minutes or till the chicken is fully cooked. Check and stir every 3-4 minutes. If you find the sauce too thick add a bit of hot water till the desired consistency is achieved. Adjust the seasoning. Add the sour cream and mix well. Do not boil after adding the cream. 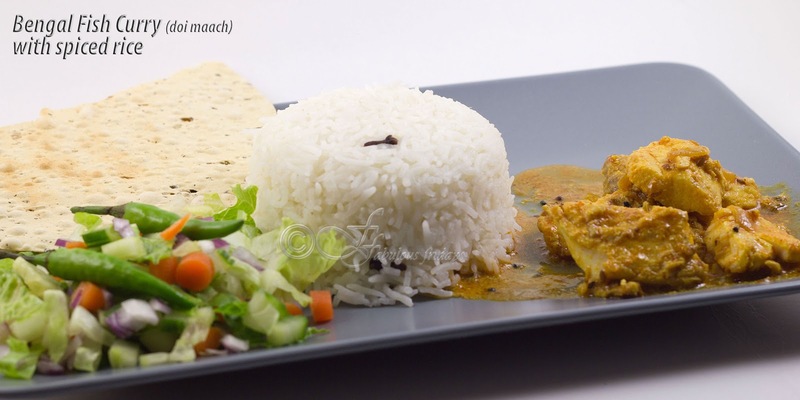 Serve with naan and salad (red onions, cucumber, lettuce, carrots, tomato). Add yeast to the flour and mix. Take warm water (not too hot or it will render the yeast inactive) and dissolve salt and sugar in it. Now make a very soft dough by mixing the warm water and yogurt in the flour. The dough should not be runny but very soft. Cover and keep at room temperature for 20-30 minutes to help rise. Mix again and using greased palms make small balls out of the entire dough. Preheat the oven to the max allowable temperature of your oven 475-500F and keep the baking shelf on the top position. Now roll these balls into naan (see shape in the picture) using dry flour to dredge. Sprinkle a pinch of parsley on top. Press lightly with fingers so that the parsley sticks onto the dough. Place them 3-4 at a time onto a non stick cookie sheet (if not using non stick then grease your sheet well). Bake in the top shelf for about 2 minutes or till it browns a little on top (see image). Keep an eye on it as the oven is very hot and can burn easily. Turn the naan and cook again for about a minute. Repeat process till all the balls are cooked. 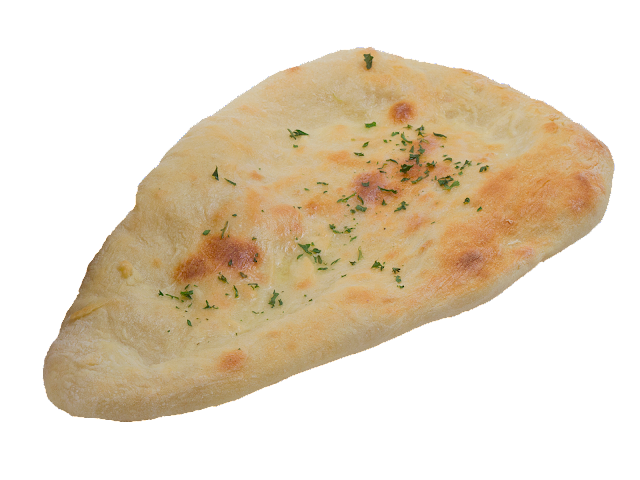 Place a bit of butter on top of each naan and serve hot.